I've always been turned off by the "Ubers" tier (which allows all Pokémon to be used, including the really strong legendary ones). Fighting matches where anything goes just didn't appeal to me. I only recently tried my first Ubers match, and I was surprised by not only the depth of strategy involved, but also how different it is to an average match with a banlist. I thought I would post some of the things I enjoyed about it. Now I am no longer thinking about doing that, for as I type I am indeed posting some of the things I enjoyed about it. Please comment below if that joke was even remotely funny. Anyway, here are my impressions of Gen V Ubers. It is notable for its ability to soothe the other members of the Weather trio, when angered. 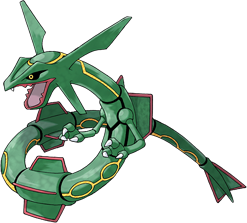 Rayquaza is capable of using various powerful elemental attacks that it shoots from its mouth. Rayquaza can negate the effects of the weather. Since Rayquaza is a Dragon-type Pokémon, it can learn Draco Meteor. Rayquaza constantly flies around the globe in the ozone layer, stopping and descending only to land on the peak of the Sky Pillar to rest. It is extremely territorial and will attack any intruders of its home. Due to the fact that it can calm the other members of its trio, it can be seen to be considered a leader and calm.